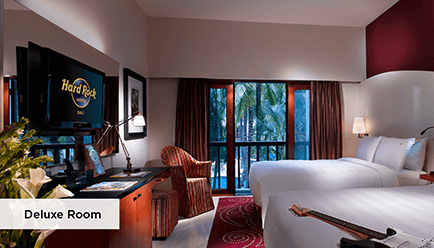 Placed against the beautiful shore of renowned Kuta beach, Hard Rock Hotel Bali is an exclusive resort devoted to the history of rock music, with rooms ‘fit for rock stars’. 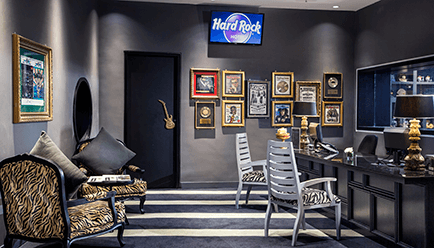 While you rekindle in the atmosphere of the past Rock n Roll culture, there is so much to love at the Hard Rock Café and Hotel. There is literally something to keep every member of the family happy. 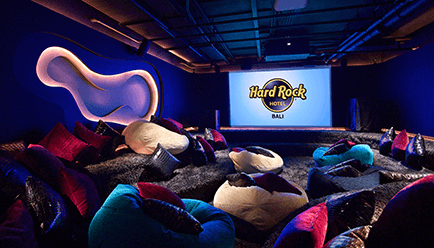 Hard Rock Bali, Asia’s first ever Hard Rock Hotel, continues to rule the legendary Kuta entertainment district, and doesn’t have a cut-off point when it comes to phenomenal fun. Hard Rock is a utopia for music lovers, with over 500 pieces of rock and roll memorabilia, collected from around the world. 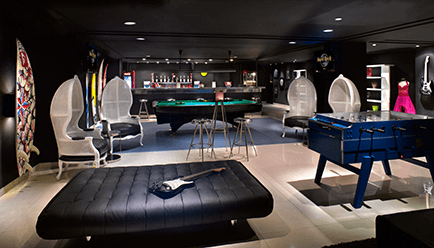 Lofts and suites are the order of the day and each one is decked out with a piece of rare rock memorabilia that makes the Hard Rock, well, the Hard Rock. Bali enriches your soul on every level. Surfing adventures, yoga in the mountains, romantic escapes, spa retreats - everything you could want is in Bali. 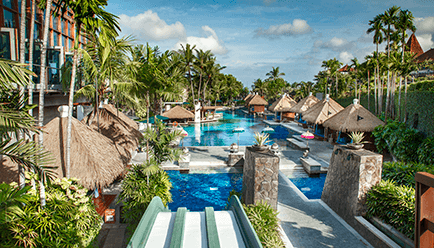 The vibrant Kuta, boasts of the best beaches in Bali, a five-mile stretch of clean sand that is a magnet for surfers and sunbathers. Nightlife in Kuta is almost frantic, as global tourists bounce from restaurant to nightclub in an effort to soak up the Kuta experience like a well-dressed sponge. 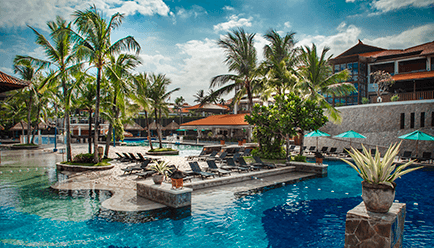 Hard Rock Bali boasts as a large hotel with 418 rooms, eight dining options and two outdoor pools. 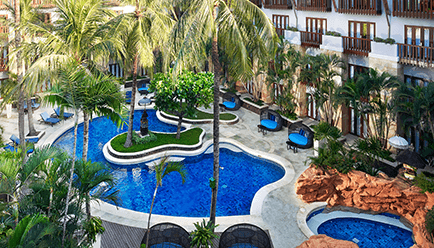 Not only is this resort home to the island’s largest hotel pool, but the place is located on an impressive 3.5 hectare prime site on the shores of Bali’s famous Kuta beach. It has also got the Roxity Kids Club for the littles, the TABU Teens Club for the bigger kids, and plenty of on and off-site activities for the young at heart adults. 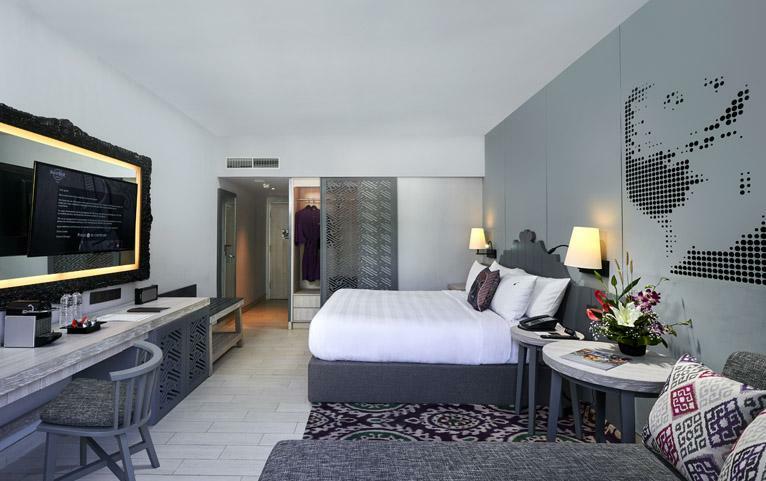 The rooms are decked out with a luxurious urban vibe – perfect for bringing out your inner rock star. Overlooking the courtyard or lush gardens and providing a direct access to it and a rug matching to a feature wall in claret, this stylish room offers a king size bed. By the French windows, there are two lovely Balinese style day beds offering the much needed tranquillity. Decorated tastefully in dove grey and white shades with highlights in softest lilac, this room offers a comfortable king size bed and sofa with trundle bed. The room also offers a living area with a coffee machine with pods. 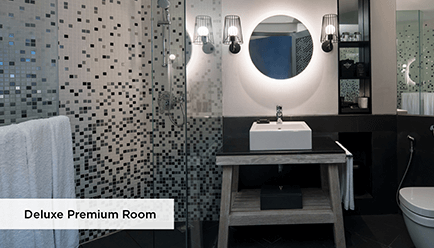 To your utter luxury the bathroom has both a hand and rainfall shower. Extra Guest Policy: Where applicable, an extra adult can stay at a surcharge of USD 40 per room per night, with an extra bed and the inclusions available in the package, payable directly at the resort. 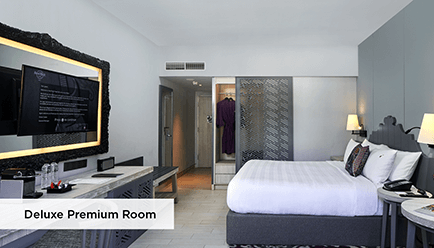 For Deluxe Room category - Two Children below 16 yrs stay complimentary with two permanent Balinese style day beds, whereas one-time dinner inclusion is applicable for two children below 12 yrs. For Deluxe Premium Room category - Two Children below 16 yrs stay complimentary with sofa with trundle bed, whereas one-time dinner inclusion is applicable for two children below 12 yrs. Health centre: The Body Rock Gym is well equipped for those who like to train and there are aqua aerobics sessions and fun beach volleyball. Entertainment: On the entertainment side, there is music until night in the Hard Rock Café and the sizeable Centre Stage is used to host rock concerts, along with fun karaoke booths and foam parties. 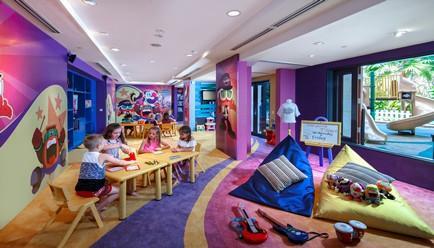 Hard Rock Roxity Kids Club: A parent-free zone for four to twelve years old, is a custom designed kids-only clubhouse fully supervised by the trained Hard Rock childcare team, with activities and events not ending to live music and dancing but arts and crafts, mini-Olympics on the pool island, etc. 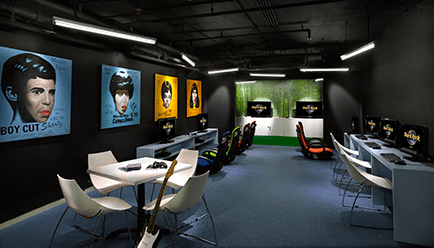 TABU: for teen superstars in training, is a cool club designed for 13 to 18 years old and welcomes families too to keep boredom at bay with DJ booths, gaming and internet zones, private cinema and live entertainment events. Hard Rock Café: Fantastic food with nightly live entertainment performances is a star signature of The Hard Rock Café. So if you wish to soak up the historic rock music alongside a legendary meal, then dance the night away at this very residence of Rock ‘n’Roll, in Bali. Splash Bistro: This stylish outdoor restaurant with a tranquil décor of white overlooks the pool and offers tempting wood-fired pizzas, a range of rockin’ pasta dishes and Mediterranean cuisine and master crafted cool cocktails by the pool. It sure does make al fresco dining more fun than ever before. 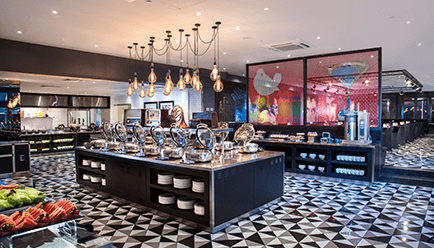 Starz Deli: A newly refurbished cool venue welcomes you to have an experience of its menu ranging from decadent cakes and pastries to healthy juice. The Shack: What’s better than to sip on cocktails all day, play Beach volleyball and relaxing by the pool. Yes, if that is what you’re looking for then make your way to the Shack. 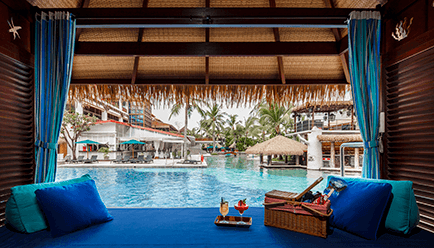 The groovy laid-back beach bar set at the Sand Island is half emerged into Bali’s largest free form pool. Centerstage: Doubles as a lobby, bar, a live rock venue and even a rock museum, this lobby bar is no other. It is one quintessential entertainment place, surrounded by Hard rock memorabilia of famed celebrities and legendary musicians. Sip on a cold refreshing drink by the day and into the night listening to the hip live bands and dance the night away. 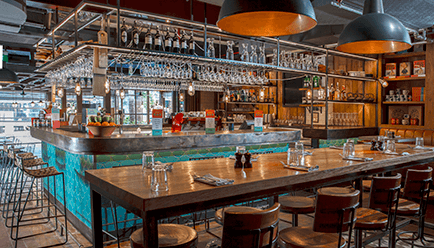 Jamie’s Italian Bali: located at a stone's throw distance away from Kuta Beach, with an ever inviting traditional scheme of pink and turquoise colour and walls adorned with local artwork, this restaurant sits in the heart of Bali’s busy entertainment and shopping district. 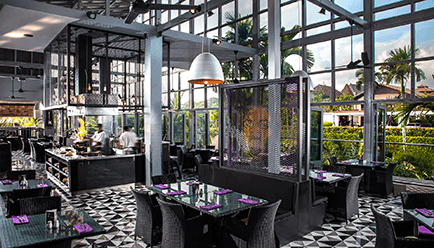 This restaurant in Bali, with a large bar and open kitchen, definitely gives Jamie Oliver’s a Balinese twist – a storm cooked up in Italian style - awarding it as an ideal place to enjoy a long lunch in the sun, a post surf pizza or an ice cold beer. Sunset Point: This Simply kick-back, relax and watch the sun go down at this theatrical animated and trendy lounge located on the third floor. Enjoy legendary mixology and bite-size bar snacks for grown-ups – yes that’s a cocktail by skilled barockers. For a plus, you can even have shisha which comes with a variety of flavours. Spa: The Rock Spa is the perfect place to continue relaxing and indulge in wonderful treatments in a sensual environment. You’ll find a sauna and a steam room, as well as a hot tub. Other Features: For those who enjoy shopping, the Beach Walk shopping centre is less than ten minutes away. If you want to get away from the resort many excursions and tours are on hand like rafting excursions on the spectacular Ayung River, a great cycling trip on a route that offers spectacular views of Mount Batur volcano at Kintamani or an elephant safari ride through forest areas. Bali is well connected by air with all the major cities of India. 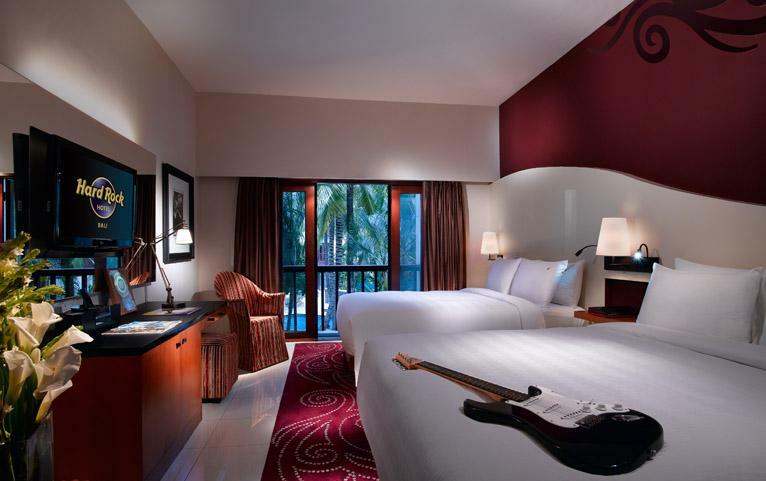 Hard Rock Hotel is about a 10-min drive from Ngurah Rai International Airport.